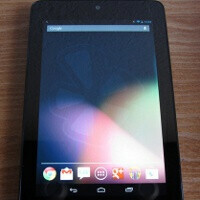 Some Google Nexus 7 displays suffer from “image retention” problems, pre-production units only affected? The Asus-made Google Nexus 7 is without a doubt a device that will change the tablet landscape - it comes with a mind-boggling price of $199 and promises a no-compromise Android experience. One area where it shines is the high-res LCD IPS display, which comes with a resolution of 1280x800 pixels which works out to a very high pixel density on the 7-inch screen. However, in some pre-production units early testers are now reporting an issue that might ruin the experience if - and hopefully it will not - it appears in some form on the final units. The issue is officially referred to as “image retention,” an effect of having the last thing you saw on your screen before switching to something else remain visible as a shadow. The shadowing effect is something that actually is typical for IPS displays, but on the Nexus 7 pre-production units it’s manifesting itself more frequently. On some IPS display you can still see for a short time a shadowy trace of your previous screen IF you switch from say black to white screen, or places with similarly big contrast. On the Nexus 7, though, this is happening even when there’s no such huge color tonality difference. Android Police contacted Asus for a comment, and the company reassured that the issue could not be replicated on final units, so there shouldn’t be any problems. Let’s keep our fingers crossed all is fine on the production Nexus 7 tablet units. Yes, but then you do not get it under $200. There is nothing wrong with your tablet, you're looking at it wrong. I have gnex running jb.I have never seen such a problem on it:-/.